Welcome aboard the spaceship We’re about to take off into space and take you on an extra-terrestrial casino online slots adventure. 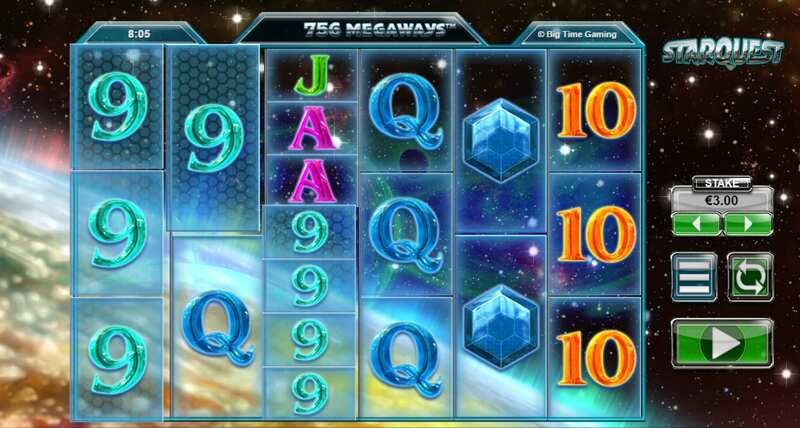 It is often said that space is the final frontier, but will it be your last chance to win on the reels and walk away with some outstanding jackpots? The female astronaut joining you on your quest will give you a helping hand when you need it, and you should find that all that stardust gives you a sprinkle of luck as well! Based in Australia, Big Time Gaming is a fairly small gaming firm with just a limited portfolio of games. Regardless of their small output, they’ve still been able to earn themselves a substantial reputation for some really outstanding games. And Star Quest is just one of these brilliant titles that match the innovativeness of their other slots, including Stacks of Cash and Queen of Riches slot games to try today. Once you shoot off into space, you will be surrounded by a black sky filled with thousands of stars. What looks like a very well lit-up planet Earth is down below you. Right in the middle of this scene are the six reels. They are transparent with blue outlines, so you can still see the space scene behind them. The metallic game logo is right below this game board. We've compiled the best UK slot online games with outstanding graphics in our guide. Come and take a look. 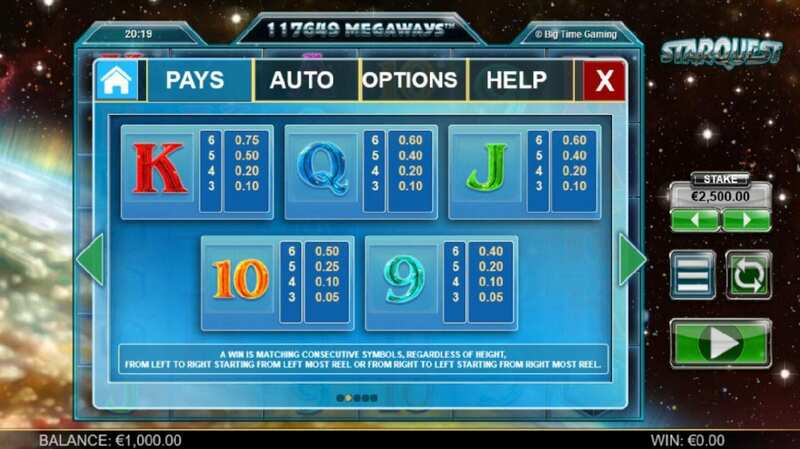 There are a whopping 117,649 different ways you could win a nice little pay-out in this game – it looks like the trip up to space was worth it after all! All you need to do is try and match as many symbols up along the pay lines. Not all symbols have equal values and some will bring bigger jackpots. For instance, all of the picture symbols are worth a lot more than the letters of the alphabet. Plus, there are some special symbols that can bring about bonus features. * WILD SYMBOL – The female astronaut is the game’s main Wild symbol. When she appears, she will take over the whole reel. She will replace any other symbol and also adds a multiplier to your winnings for that one spin. She will stay on the board for random periods of time and if she decides to stay for a while, she will activate the Respins Wilds round. There is a chance that another one of these space-age girls could land on another reel during the Respin Wild round. If this happens, she will become a Sticky Wild and will remain on the reel for at least one spin.